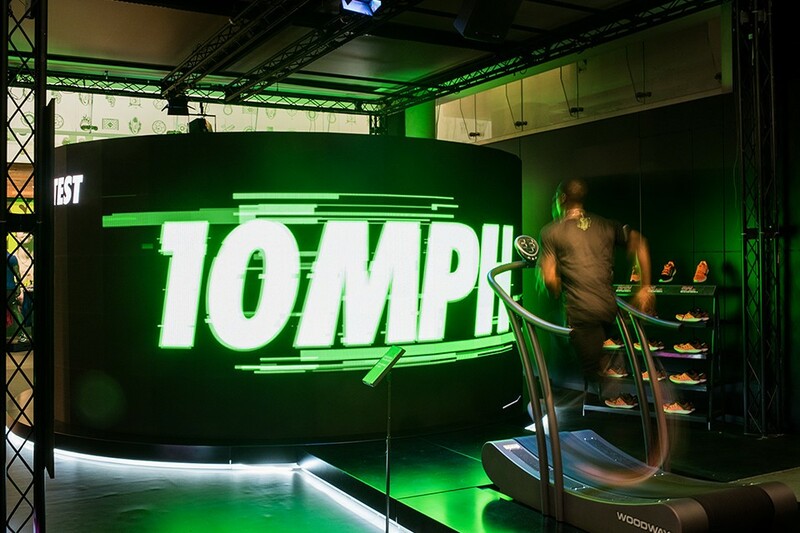 We created a consumer trial experience centering around a 5m diameter circular LED screen and a pair of self-propelled treadmills that can track speed data. Participants then got the chance to see if they could run fast enough to get on the leaderboard and become one of London's fastest. Upon entering NikeTown London consumers were greeted with an invitation to try on a pair of ultra-responsive Zoom Elite running shoes. Once fitted they were invited to trial their shoes. Consumers were registered using an ipad for their trial and taken through a short induction warm up to get their heads in the game. Once each participant had completed their speed trial they were sent an email providing them with their top speed and how they rank against London's Fastest. They could then share this with the world and prove their prowess via the shareable links. A network enabled iPad app controller system, a high impact 5M diameter circular LED screen and a pair of self-propelled treadmills that can track speed data. The faster you ran the more animations were unlocked. Once each participant had completed their speed trial they were sent an email providing them with their top speed and how they rank against London's Fastest. They could then share this with the world and prove their prowess via the shareable links.